Suzy Creamcheese wrote: Binko, which WC was that? Just curious - I live in Bridgeport, so chances are good I've been there (I have a sick secret love for WC). Aha, I do know that one! It's actually the first White Castle I have memories of. I'm not exactly sure how long it's been there, but I remember my parents buying a bunch of burgers from them in the late 70s/early 80s. I was fascinated by the little things. Yes, it does feel a bit strange being there 30+ years later celebrating Valentine's Day with my wife. I also remember when that corner had a Huck Finn's across from the White Castle, but that lasted into the 90s, I think. Driving by the White Castle at Ridge and Clark today, I noticed that they are once again inviting reservations for Valentine's Day. bw77 wrote: Driving by the White Castle at Ridge and Clark today, I noticed that they are once again inviting reservations for Valentine's Day. Sweet. My wife actually suggested yesterday that we should do it again this year. Unfortunately, my 47th & Archer White Castle is no more. Now the nearest one is the one on 63rd near Midway. Just a couple of comments and a question about White Castle. Of the fast food joints,I have heard from former employees that they paid better and had better benefits than almost all of other ones. They will make a "doggie slider" whereby they will make a plain slider and if you request,cool it down to feed to your dog. I'll forgo the obvious "dog food" jokes. While browsing the website http://www.whitecastle.com/nutrition I noticed the regional specialties such as hamburger sauces in Detroit,Chicago,and others such as breakfast sandwiches with bologna and wonder if any members have tried them? Never tried any of those, but apparently they now have (at least at some locations) potato bacon chowder, which kind of threw me for a loop. Binko wrote: Never tried any of those, but apparently they now have (at least at some locations) potato bacon chowder, which kind of threw me for a loop. That reminds me I did see a sign in my local porcelain palace (my Dad's description) for that "Thick creamy chowder with chunks of potatoes,veggies,and delicious bacon crumbles"
White Castle has come up with dozens of interesting new menu items, some of which they have brought to their menu on a temporary basis. Soup is not one of the items I have seen in their test marketing. Talk about throwing one for loop In August of 2010,I happened to be in Lafayette,IN for the opening of this "concept"
that's my favorite wrote: Talk about throwing one for loop In August of 2010,I happened to be in Lafayette,IN for the opening of this "concept"
Wait. I'm a little confused. So White Castle has a "barbecue" restaurant spin-off in Lafayette? Am I understanding that correctly? As much as I enjoy WC, I have to ask why? Anyhow, reservations made for Valentine's Day. Wife was getting a little antsy as their website said the Chicago locations were almost fully booked. Being a sucker for most things sriracha, tonight I tried the sriracha chicken sandwich. The ad mentioned jalapeño strings which were missing. A simple statement of I don't need to go back will suffice re: the sandwich. Sweet Willie wrote: Being a sucker for most things sriracha, tonight I tried the sriracha chicken sandwich. The ad mentioned jalapeño strings which were missing. A simple statement of I don't need to go back will suffice re: the sandwich. You really need to get the "ultimate" verrsion, which contains the pepper cheese and the fried jalapeno pieces. I think these are better than decent for the the genre -- way better than Chik Fil A, for sure and ertainly one of the better 'specials' I've ever had at WC (not a particularly high bar). Yeah, I tried it today and, I'll be honest, it wasn't terrible, but it didn't quite work for me. Just a jumbled mess of pepper flavors, and the chicken was dry with too much crust:chicken. It's not something I feel the need to try again, but I understand if someone else likes it. I'm not sure what the Chik Fil A reference is, but if it's to the regular Chik Fil A sandwich, then our tastes are simple calibrated oppositely. White Castle remains a hamburger destination for me. If I want something spicy from them, it's the jalapeno cheeseburgers, all the way. Binko wrote: I'm not sure what the Chik Fil A reference is, but if it's to the regular Chik Fil A sandwich, then our tastes are simple calibrated oppositely. White Castle remains a hamburger destination for me. If I want something spicy from them, it's the jalapeno cheeseburgers, all the way. That's probably true. I don't eat a lot of breaded chicken patties, so it's probably just me but I find nothing interesting about Chik Fil A's patty. I was surprised, after hearing so much about Chik Fil A, how completely unremarkable it was. White Castle is and will always be a burger place for me too but I thought their chicken sandwich at least had a little something going on . . . and I was only a little bit drunk. Like I said, it wasn't terrible, and it was surprisingly filling. I mean, I hit it late this morning on an empty stomach and one sandwich had me well sated, but I ordered two, expecting it to more on-par with a regular White Castle offering in terms of filling-ness. But Chik-Fil-A, as much as I don't want to like them for certain reasons, damn, I really like their straight-up chicken sandwich. I've actually never ventured beyond their basic sandwich in their menu, I like it so much. No, nothing fancy. Not a lot going on. Just a to-the-point fried chicken sandwich. We split a Chik-Fil-A chicken sandwich last Friday night (our first option, Epic Burger, was closed). Carolyn ordered it grilled, which would not have been my choice, but it was okay. Just okay. Fuel. Binko wrote: Like I said, it wasn't terrible, and it was surprisingly filling. I mean, I hit it late this morning on an empty stomach and one sandwich had me well sated, but I ordered two, expecting it to more on-par with a regular White Castle offering in terms of filling-ness. You are so right. Very fillling. Unfortunately, I just ate 8.5 of the Ultimate Sriracha Chicken Sliders to settle stupid World Cup bet I made last week and I can say with virtual certainty that I'll never eat another one. I learned 2 things: never make a bet where eating food is the currency and when betting aggregate goals in a day's worth of soccer games, always take the 'under' even if the 'under' is very low. David Hammond wrote: We split a Chik-Fil-A chicken sandwich last Friday night (our first option, Epic Burger, was closed). Carolyn ordered it grilled, which would not have been my choice, but it was okay. Just okay. Fuel. ronnie_suburban wrote: You are so right. Very fillling. Unfortunately, I just ate 8.5 of the Ultimate Sriracha Chicken Sliders to settle stupid World Cup bet I made last week and I can say with virtual certainty that I'll never eat another one. Oof. In terms of fillingness, that's like about 15 regular sliders' worth to me. Impressive, assuming you're not a 16-year-old. I have to come back to my ultimate sriracha comments and revise a little. I ordered a couple of jalapeno cheeseburgers the other day and threw in one ultimate sriracha chicken sandwich just to give it another shot. And, I have to say, the second time was better than the first, with the chicken patty being much more moist and meaty than the first time. I'm still not sure about that mish-mash of pepper flavors, but I think I might just put a single one into the regular rotation to accompany my White Castle cheeseburger orders. 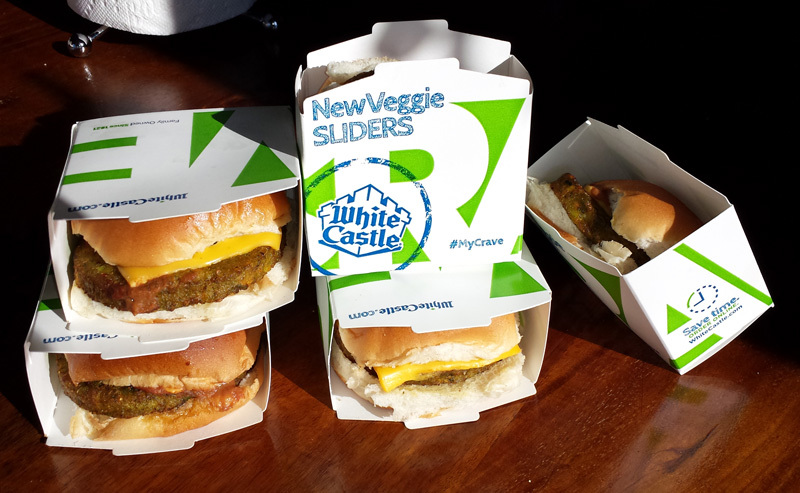 Veggie Sliders are now available at White Castle. For a place that has gained fame and misplaced love for serving animal-based gray paste on squishy bread, this is kind of a breakthrough. Though Burger King does offer the MorningStar Veggie Burger, to the best of my knowledge McDonald’s has yet to put a vegetarian entrée sandwich on their main menu (at least in the U.S.; in India, McDonald’s has some all-vegetarian restaurants). Ray Kroc did, however, experiment with a Hula Burger – grilled pineapple with cheese – which I enjoyed at McDonald’s corporate headquarters in the early 80s: it was not a commercial success, and that’s because it really didn’t taste very good and had a strange texture. My dislike for White Castles remains a matter of record, despite the protests of those brainwashed by marketing or so blinded by youthful binge drinking escapades that they believe they actually crave this “food”. But I’m all about second chances (hey, Carolyn has given me more than one of those already today), so when I heard that White Castle was offering Veggie Sliders, I thought I’d go there for a snack. For test purposes, I bought an Original Slider, as well as the Veggie Slider, and a small order of Onion Chips – onion fragments fried crisp – which I actually liked more than either of the sandwiches. They’re crisp, crunchy, and the grease is balanced by the slight acidity of the onion, just like with onion rings, but unlike the onion rings, these small pieces can be just popped in the mouth, whereas when you bite into the rings, the circular slice of onion tends to disengage from the breading, making the harder to eat and less tasty. 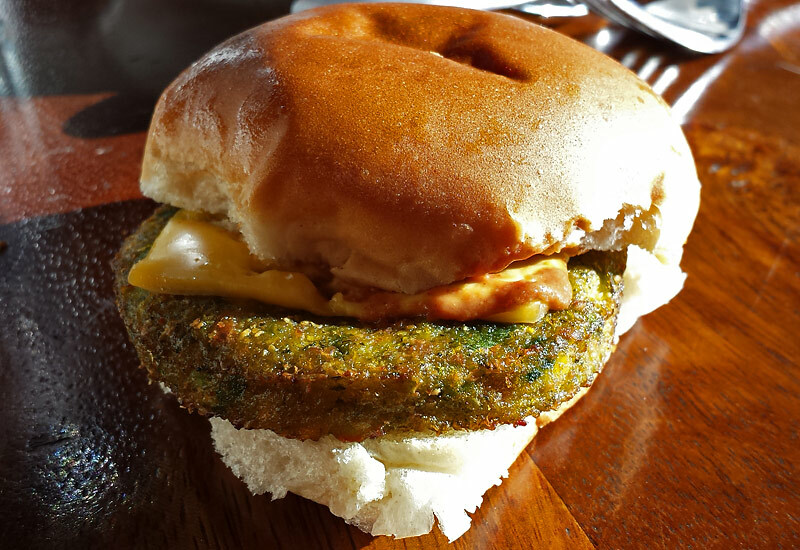 Veggie Sliders are not bad – not actually good, but not bad, a cut above the abysmal Original Slider. These Veggie Sliders don’t have the slightly meaty quality of Boka burgers, but the vegetable taste is light and clean. Actually, if I ever find myself in a White Castle again (and if there is a god, I can’t believe He or She would let that happen), I might very well order another Veggie Slider. The Veggie Slider is a product from Dr. Praeger’s [http://www.drpraegers.com/] line, and I’m glad to say it was way less greasy than a regular slider…still, the calorie count of the Veggie Slider is equivalent if not a little higher than Original Sliders (depending upon what kind of toppings you get), which is kind of amazing and revolting. Dr. Praeger’s branded products are available at Whole Foods and Trader Joe’s, so this is an upscale option at WC. The Veggie Slider is 99 cents and the Original Slider is 70 cents, so you pay for quality (such as it is). In the picture, you can see that the veggies are poking through the Veggie Slider, which looks better than the sad grey meat of the Original Slider. Much like the meat of the Original Slider, the Veggie Slider is warmed but not crisp. I was actually kind of hoping they deep fried it, so that it would be a kind of a crispy vegetable fritter, but that was not to be. I’m glad I tried this new menu item and somewhat glad that there’s actually a few menu items (including the Onion Chips) that are marginally edible at White Castle. Overall, though, eating at this place was a sad experience. The training of the staff is abysmal: for my simple three-item order, I had to repeat myself three times, each time progressively slower and with more pronounced enunciation. Maybe it was just hard for the counterperson to comprehend that anyone would order less than 4 of anything (the guy in front of me ordered several dozen sliders in various configurations). The counter person didn’t ask me what sauce I wanted (there are three options with the Veggie Slider: Sweet Thai, Honey Mustard and Ranch), so I ate mine dry: McDonald’s counter people always ask what sauce you want with, for instance, nuggets. Say what you will about McDonald’s food, they do a fine job of training their staff (having written some of their training videos, I take some pride in that). 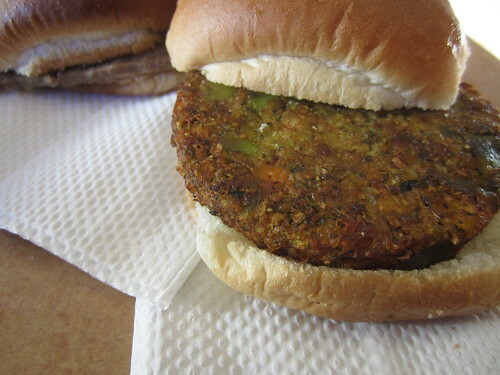 Still, if you’re a White Castle enthusiast, the Veggie Slider is probably good news. It’s likely a welcome change of pace to throw a few Veggies Sliders into an order of 4 or 8 or whatever number of sliders you’re ordering. I have to believe that with food this one-dimensional, palate fatigue sets in pretty quickly, and it’d probably be nice to slip in a little something different between bites. COUNTER PERSON #2: You put it up! COUNTER PERSON #1: I put it up so I have to take it down? COUNTER PERSON #2: That’s right! White Castle is not a happy place. Last night, I actually had a nightmare based on my experiences there. The counter person didn’t ask me what sauce I wanted (there are three options with the Veggie Slider: Sweet Thai, Honey Mustard and Ranch), so I ate mine dry: McDonald’s counter people always ask what sauce you want with, for instance, nuggets. Say what you will about McDonald’s food, they do a fine job of training their staff (having written some of their training videos, I take some pride in that). WC staff never ask what you want. You want ketchup? Tell them. Pickles? Tell them. Their famous "Everything Sauce"? Tell them. Perhaps WC actually trains them to never ask. If that's the case, and for the sake of discussion let's say it is, then I'd have to admit, at the very least, that their training is very effective. Perhaps they're also trained to air their personal grievances publicly (at least during Festivus season). Sauganaut wrote: So when are you going back? Based on my visits over the past 40 years, my next visit is projected to be around 2027. I can wait. Yep, as innovative as a slow-cook microwave oven. Our resident vegetarian at the office was willing to try them. He's as staunch as they come and the fact that they don't really resemble meat at all was a plus for him. I'm guessing there's no less beef in these than in the regular sliders! Lose the cheese, hit it with some hot sauce and I'd eat it.